"This is exactly what I was looking for. Very good quality leather and zipper, nice price point and holds everything I need. Easy to slip in a pocket. Super fast shipping too. 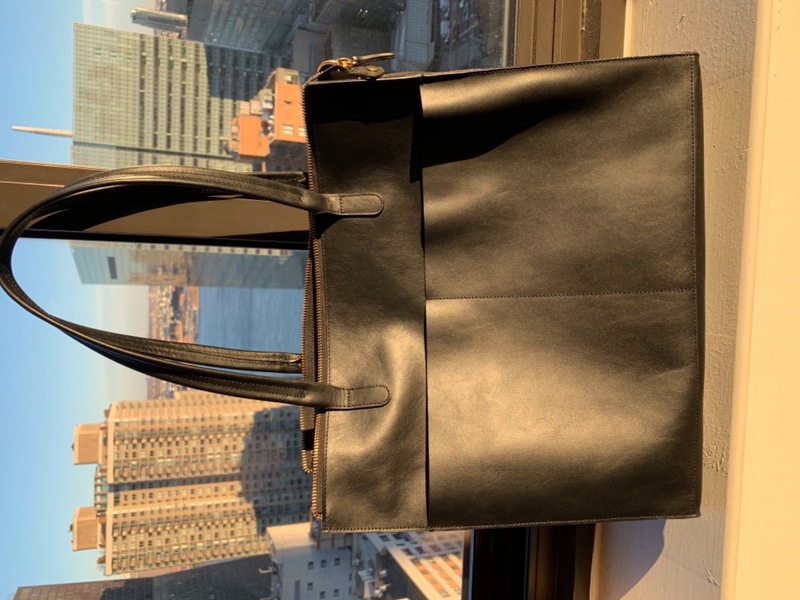 Win win win😍"
"I love this tote! The leather is so soft and it looks great with pretty much anything I wear. The pockets in the front are perfect for grabbing your phone when you need it. I get lots of compliments on it all the time. It's well worth it!" "This bag is amazing. The leather is soft yet durable and the shape is unique for a basic minimalist bag. I love the way the bag is separated into two sections. Very happy with my purchase!" "I love to keep my drivers license , a credit card and few dollars in this tiny wallet that I can change from purse to pocketbook. It fits in anything. Thanks!" "I am very pleased with my Minor History experience. The transition went smoothly from start to finish. The quality of the merchandise is the best. I bought my first Minor History bag ( a silver clutch) at a boutique in Barbados while on vvacation. I receive so many compliments. I am sure my new bag will be the same! More to come!" "It’s exactly what I was looking for." "I love my oyster wallet! I got the oiled saddle color and it is just as pictured. There are actually 4 slots for credit cards - 3 inside the wallet and one on the outside. I couldn’t tell this from the photos online, so it was a pleasant surprise. The wallet is sleek and fits in my small purse perfectly. The quality of the leather is great too. Very pleased with this purchase. I highly recommend!" Love this white gold bag! "I love this bag. It is my fourth bag from Minor History. It is sparkly enough to be dressy and roomy enough to carry everything with ease. As usual the the quality is great." "So easy and fast ship!" "The leather is soft but sturdy and with beautiful construction!! Very professional without seeming pretentious. Love it. " "Love this wallet - very cute, very well made. " "Bought the red cylinder bag and jewelry case, Really wonderful quality, comfortable and unique!" Everything I've been looking for in a bag! "Incredible - the leather is super high quality, the size is ideal for a full day and can fit more than you think! It's beautiful and timeless ! " "Absolutely LOVE this product. It is exactly what I wanted! Allows me to be stylish while also practicing minimalism. " "Beautiful color and very well made. Very happy"
"The leather is super soft and the function is also good." "I needed a compact card dumpster that I could cram some cash in and this fits the bill with gorgeous style. I love it." "Such a beautiful bag, soft leather, and a zipper!" "This wallet is everything I have been looking for. It’s the perfect size, easy to use and goes with everything. " Elegant, minimalist purse- fits everything I need and nothing more! "I love this purse. It’s so sleek and timeless. The leather is really soft. The strap is adjustable to you can choose where the purse falls on your hips. The bag fits my phone, wallet, keys, gum. But it’s not bulky and it doesn’t give me space to carry unnecessary things! Minor history’s customer service is amazing, too. I’m hooked!" "My experience with Minor Hostory was incredible. I got the incorrect color on accident as a gift and they were so easy to work with and sent me a return label right away to exchange! I love my bag it is such great quality and I have been using it everyday! " "Optimal size to carry all everyday belongings yet still lightweight, made from quality leather, and looks sleek. Great purchase!" "I am in love with my new wallet from Minor History! I had been looking for a new wallet for a long, long time when I came across your company. I didn’t want the same old thing - and fell in love with the Ledger and placed my order. It is just beautiful - I love the accordion style and the leather is soft and beautiful. The wallet arrived very quickly (I’m in Toronto) and beautifully packaged. Thx!" "I have been using the full moon bag almost non-stop since I received it. The leather is high quality and has the great leather smell <3 It's a great size for everyday use. I also like how the bag holds its shape. Very happy overall"
"I saw this in a boutique in Nashville and I was obsessed with the clean classic lines. I just ordered 2 and will order a 3rd when back in stock. I think it will look great years from now. It is simple and excellent quality. Plenty of room while still looking chic. " My Favorite Gift...I picked it, of course! "I’m very happy with my purchase; it was just what I wanted; beautiful leather and workmanship. I’m so glad I thought I was worth it! Suzanne"
"I've become pretty obsessed with this brand lately. What drew me in was the color combo of gold and tan that I saw in a shop not too long ago and now the quality of leather is what has me buying more and more. It's super soft and I love the minimalist design aesthetic, it really matches my style!" "A year ago I bought my first Minor History piece in a store. I was drawn by the color—almost electric lapis—and chose the Oyster wallet which may be the most practical currency holder (bills and cards) I’ve had in my life. It remains simply beautiful. Since then I’ve bought multicolored Biggies as gifts and a new Tourist for myself. The pieces achieve just the right balance between luxe and casual. And the service is prompt and very kind. I’m not a wealthy person but I love beautifully imagined and realized things. These pieces last and grow more beautiful over time. If you like them when you see them online, you’ll be amazed by how glad you feel when you open the box, lift out the dust bag, pull open the drawstring and hold your new bag in your hands." "The wallet is beautiful- gorgeous leather and good craftsmanship. Its hard to find one this streamlined, without flashy logos or hardware, and yet still rather large and functional. Beyond the product, my experience with their customer service due to a delivery mix-up was incredible. Couldn't recommend this company more!"